Ever dream of having your own reception hall or a dining room that could seat 20 people or more? Thanks to the housing bust, these mansions offer thousands of feet of living space for less than what it costs to buy a one-bedroom condo in New York or San Francisco. 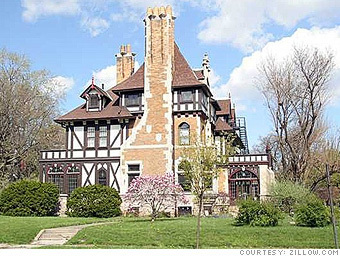 Construction of this Tudor revival mansion began around 1900 for licorice tycoon Alvin Tillinghast. However, he ran low on funds and the builder took back the unfinished home, eventually trading it for 12 Pope-Toledo motorcars. It's clear where some of Tillinghast's money was spent. No expense was spared building this home, which features chestnut woodwork and an oak staircase with a triple, stained-glass window at the landing. The huge living room is mahogany trimmed and boasts a large gas fireplace. There are both a butler's and a maid's pantry. Much of the house has been preserved in its original condition thanks, in part, to its long-term owner, the Oblate Fathers, a congregation of Catholic priests, says listing agent Judy Stone. The price of this mansion may seem like the steal of the century but recent sales of nearby homes, like that of a 3,400-square-foot Victorian for less than $150,000 in June, indicates it isn't too much off the mark for the area right now. Taking advantage of today's beaten down home prices and record-low rates, baby boomers are buying their dream retirement homes -- years before leaving the workforce.